When we first got the idea for The Conventional Adventures of Isabel Gonzalez at Dvorak HQ, my co-conspirators thought it was a brilliant idea. We wanted a way to get convention-goers interested in the interactive element of the series. 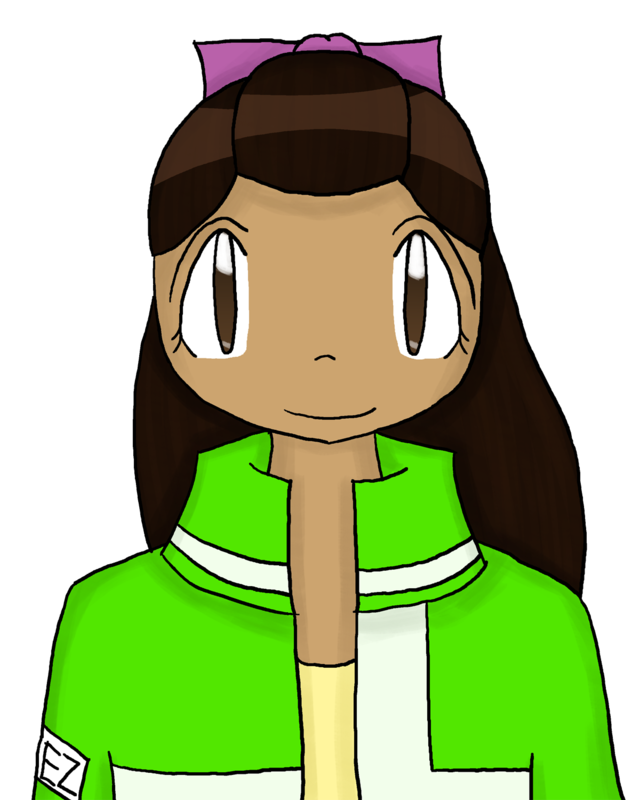 Instead of interrupting the actual series' flow, we took fan-favorite character Isabel Gonzalez and made her the main character. 3: I was NOT anticipating over 700 suggestions. The past two years, I have shared a small-press booth at NYCC with my roommate and fellow author Tamsin L. Silver. (If you thrive on vampires, witches, and werewolves, check her out.) The important thing about small press is that it's kind of the area everybody else walks around to get to the big booths. It's a great way for people to get noticed...if con-goers will actually walk through it. Plus, sharing a booth with Tamsin meant I was regulated to a very small portion of the con. This year, due to several varying circumstances, I ended up in retail -- a bigger booth with (I didn't know at the time) better traffic. I figured it would take an hour to get our first visitors, but it took two minutes. And it didn't stop there. The guys at the front of the booth literally didn't stop running the entire convention and got so many people to spin the wheel that we ran out of postcards and I had to send someone to Kinko's to print off more. (Note to self to print off more for next year.) By the end of the convention, I had four days worth of STACKS of suggestions and no clue how to organize all of it. And it will get done. This is just taking longer than I thought, considering the circumstances. It's my hope to have chapter 4 done tonight and chapter 5 done tomorrow. Whether or not this gets done will be determined by a lot of factors. The craziness at my house hasn't stopped, I've just insisted that my life go on. I'm not going to beat myself up about it! If you're reading along, feel free to comment -- if you have a last minute suggestion, I should be able to add it. With that, we continue our adventures in Jenny Love Lee Land! Thank you to everybody who came out to New York Comic-Con this weekend! I'm so glad I got to meet all of your smiling faces. We're a little backed up at HQ with things we need to do; Isabel Gonzalez will be updated tomorrow night (hopefully with the ending). See you all then! We've been having a lot of fun at New York Comic-Con this weekend, interacting with fans and writing The Conventional Adventures of Isabel Gonzalez. Chapter 2 is up and, true to form, has included all of the suggestions made on day 1 of the con. I feel I did a good job with the subject matter, considering how many people gave us forms and how many papers contradicted other papers. Due to issues with our printer, we finally got CDs at the end of the day, and will have them on sale on both days 3 and 4. Stop by to win one or pick your CD up! They look fantastic in their cases and match the color scheme on the posters. We were able to get the CD playing at the booth today, so everybody was able to listen to the music, and by the end of the day everybody had the songs stuck in their heads. We kept singing them all the way to the after party, where I performed the remix of Midnight Rave and my friend Americk performed the track Star Wars from the SqrL-X album. It was a lot of fun to perform these tracks and to put the album together! I'm really hype for people to see the discs themselves. Stop by and get your copy! A quick update from Dvorak HQ -- I'm the silly girl who didn't get pictures for day 1, but thank you so much to everybody who stopped by! We've been collecting suggestions for The Conventional Adventures of Isabel Gonzalez, and I just went through my pile of suggestions for tomorrow's chapter! I'll be writing all day, so be sure to say hi, and then the chapter will be uploaded here tomorrow night. 1: Friday is White Rose Day! A new chapter of The White Rose of Fiorazzurro will post here as scheduled. To celebrate, if you mention white roses to us at the booth, giving us the magic password like the people in the book do, we'll give you half off your order! This counts for Friday ONLY and the password must be used on a Dvorak crew member. 2: You remember SqrL-X? He never actually made an appearance in a Dvorak book, but most people remember him as the artist from Y-MH-560-B who remixed political music, and ended up with tracks on Jason's boombox. Tomorrow and through the rest of the convention, we'll have SqrL-X music playing at the booth courtesy of the 4D Foundation! We've been hard at work on this album for months, and you can pick up a copy at the booth to take home with you. Get ready to get live! 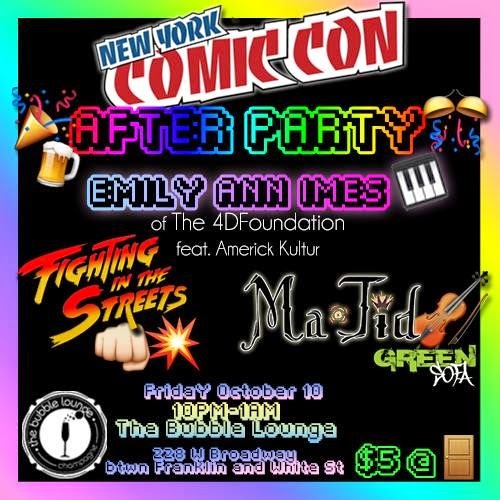 3: I will be a special guest on Friday at a NYCC afterparty. I'll hopefully be performing some tracks from the SqrL-X album, but regardless, I hope to see you there! The flyer for the show is below if you want the details. This appearance is also being handled by the 4D Foundation. Thank you all so much -- expect pictures and Chapter 2 of CAIG tomorrow! First chapters of Conventional Adventures do not take suggestions from the crowd as there is no crowd to get the suggestions from. Chapter 2 will use suggestions from the first day of convention; Chapter 3 uses Day 2, and so on. New York Comic-Con is FINALLY HERE! And we're ready to deliver with our first ever Dvorak booth! I know I'm ready for an entire weekend of Dvorak and fun, and if you're stopping by, I'd love to invite you over to the booth to see what we're all about. Dvorak's booth is in retail in row 500, booth number #580. We put the finishing touches on our booth yesterday, and we're hoping you can stop by. Our special for the con is buy two books, get one free. This is great if you're new to the series and want to discover Dvorak for the first time, or if you're getting gifts for friends. We'll also have a wheel you can spin to win some cool Dvorak swag. If you don't win anything straight-up, you'll be able to put your name into a drawing for a free set of books! The trick is this: New York Comic-Con will mark our first journey into The Conventional Adventures of Isabel Gonzalez. Everybody's favorite QWERTY member, Isabel Gonzalez, is going solo to save worlds all over the parallel universes, and she needs your help! Suggest something to happen in Isabel's story and you'll be entered into the drawing. There is one last surprise that I want to tell you about...but I'm going to save it for tomorrow. If you're able to stop by the booth today, you'll know what that surprise is before everybody else!